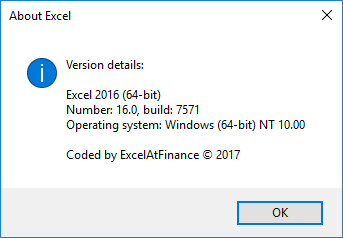 Description: returns the version number of the Excel application. Excel version information is displayed in a message box. Example output is shown in figure 1. Fig 1a. - Version message box displaying the output from the GetXLver macro. Selected VBA functions used in this module. 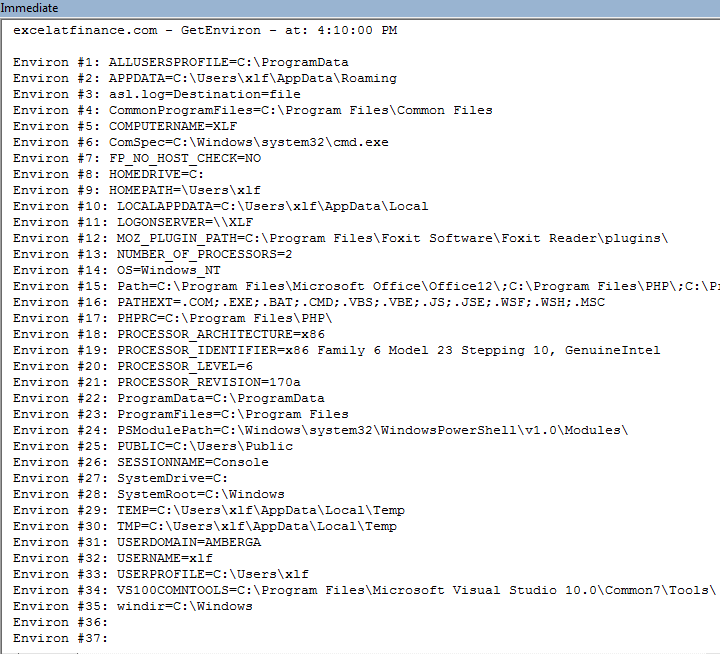 VerNo = "Excel 2002 (included in Office XP)"
If Len(Environ("ProgramW6432")) > 0 Then s64bit = " (64-bit)"
About code 1: the Application.Version number, line 6, is returned as a text string by the Select ... Case statement. 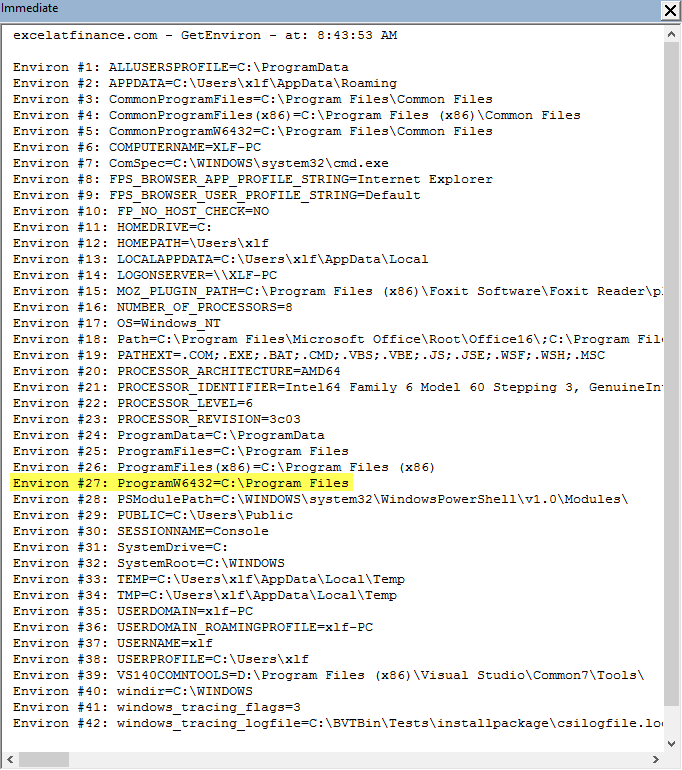 Identification of the 64-bit version is shown in line 31, and exists if the Environ string "ProgramW6432" has greater than zero characters. Further details of Environ are shown in code 2, and figures 2, 3 and 4. Line 34 to 36 build the message box prompt. 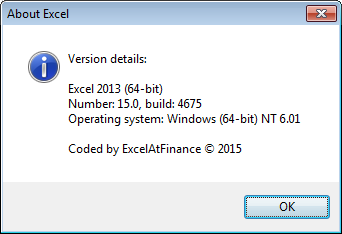 Sample output (Excel 2013 64-bit running in a windows 64-bit environment) is shown in figure 1 above. Do While EnvironVar <> ""
Do Until EnvironVar = ""
The GetEnviron macro in code 2 is run in a Windows 64 bit environment and a Windows 32 bit environment, and the output is shown in figures 2 and 3 respectively. The ProgramW6432 variable is shown as variable #25 in figure 2. 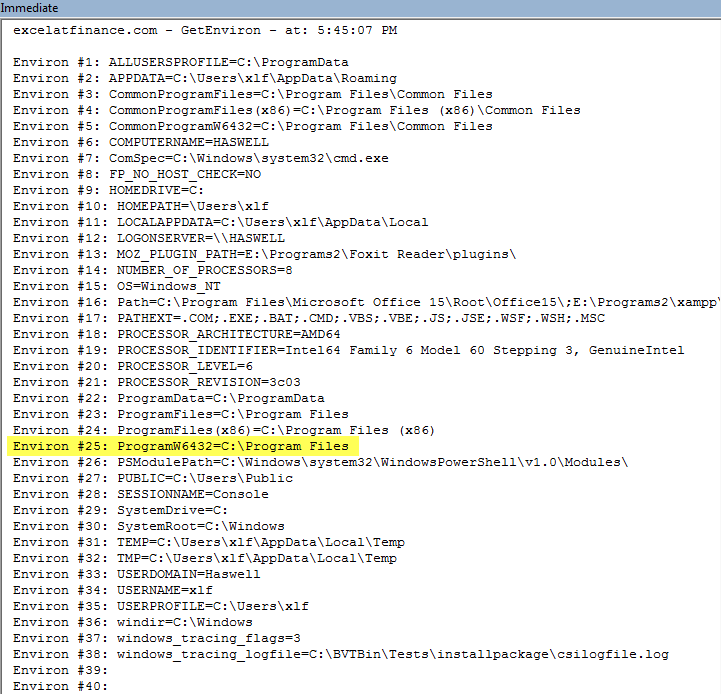 The output for Windows 10 is included in figure 4. This example was developed in Excel 2013 Pro 64 bit, and Excel 2016 (Office 365 ProPlus).